Scandinavian interiors are known for their neutral colours, warm accents, and mid-century modern furniture. This minimalist style embraces simplicity. Want this look? Take note of our few tips on how to achieve your Scandinavian look below. In most Scandinavian spaces, walls are kept white to keep a clean and simple look. Colours like white, grey, and blacks, are most likely to be your colour palette. However, you can bring in soft, pastel colours. Find our favourite whites here. 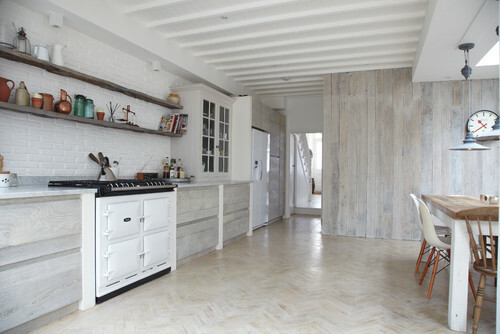 In order to keep your Scandinavian feel, you must have light floors. Whether it be your traditional light wood floors or white/grey tiles, this allows the space to feel bright & airy. A minimalist design can be plain and boring, if not accomplished correctly. It's all about layering neutrals and natural textures. Bringing in wood through your furniture pieces allows your space to feel cozy - A simple way to make your room brighter without using bold colours. 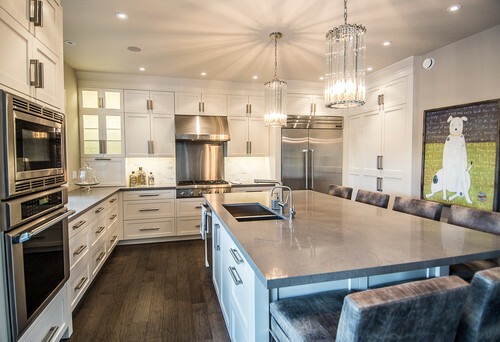 Adding metal finishes really ties the space together whether it be through your lighting or accent pieces. Bring a little life in your home with plants. Don’t add anything too colourful, but the right amount of greenery is an important key to bringing your Scandinavian Decor to life. This may be a hard one for many people. Without realizing, we all have a tendency to clutter. In this type of design, less is more. If you want your space to feel calm and inviting, any unnecessary items must go! I’ve found that Scandinavian interior lighting is simple yet beautiful. 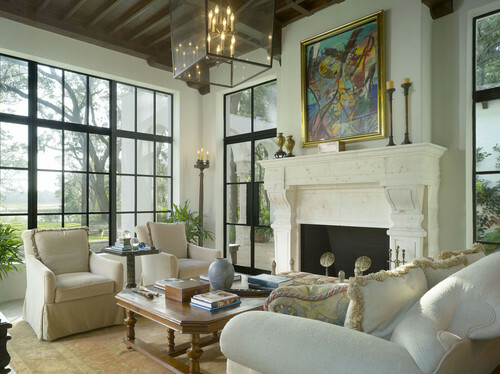 I love the look of a wicker pendant, although the classic glass lighting fixtures compliment this design very well. There is a fine line between simple and boring, but with these 6 tips on how to achieve your Scandinavian decor, you've got nothing to worry about! Art is a tricky one for us. We often get asked to source artwork for our clients and although we LOVE the idea, it is very time consuming and difficult since art is so personal. We can nail every aspect of a decor project but sometimes our clients vision of good art and our own simply don't align. Our concept boards usually include some inspiration prints to set the tone for the decor, which sometimes give our clients a direction to take when choosing their artwork, but that's as far as we'll take it. Now that you know we aren't art pros, let's make it clear that we totally appreciate beautiful pieces and we can spend hours browsing! Here are some of our top artists and photographers. You can thank us later! A photographer who has a passion for flowers, travel, and paris who creates stunning pieces of art. She has a natural talent for capturing the beauty in architecture and nature. You can find her work here. A self taught photographer who captures the beauty in flowers. Not only does she sell art prints, but wallpaper and fabrics as well. Visit her website here. A local Montreal based artist who creates beautifully hand painted abstract art. Visit her website here. A popular one but oh so good! Gray Malin is well known for his aerial beach shots. We love the whimsical feel in his shots and all of saturated or muted hues. He really has a unique eye for capturing something special. You can find his work here. If you're into bold, saturated colours, this is the artist for you. Her work feels playful and fresh and it's so simple but there's just something so eye-catching about it! One of our main goals at Hibou Design & Co is to create a design that is timeless. Our idea of a timeless design is to design a space with a neutral colour palette. However, we always like to incorporate colour in a way that isn’t too overwhelming. We notice that some of our clients are scared of colour. Will it be too much? What if I don’t like it? So, we decided to list some of the ways we like to incorporate colour into our designs. 1. 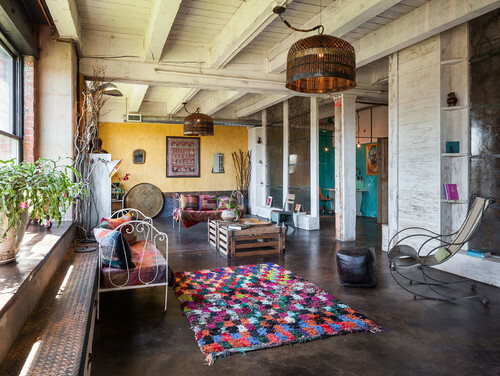 A rug - an easy way to incorporate a colourful pattern or detail. We love how Studio Mcgee incorporated this beautiful blue patterned rug in this very neutral colour palette. It definitely is bright and airy with the perfect combination of colour in her accessories. 2. Accessories - The perfect, non-permanent way to bring in your pop of colour. You can have one accent colour or a grouping of several. These can be from pillows, to throws, and a variety of small objects. The perfect example by Jacquelyn Clark of how to accessorize your space with different shades of the same colour and have it tie within two spaces! 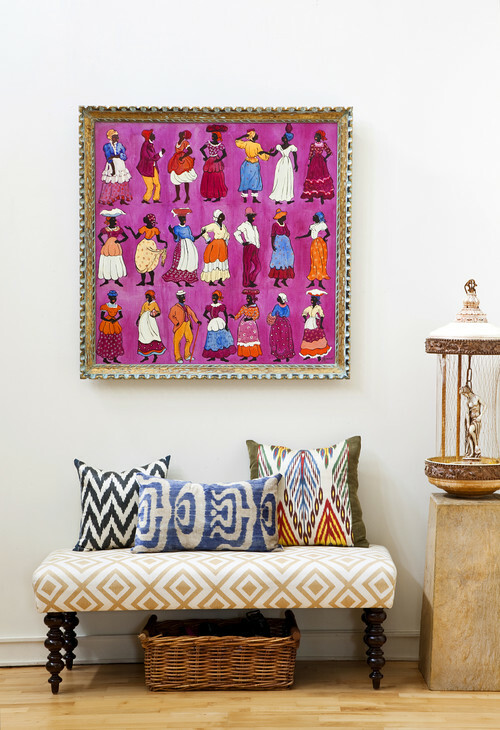 3.Art - Let your colour take charge and create a conversation starter with one of your favourite pieces or if you're not bold enough, start with muted colours to incorporate your desired colour. We can't tell you how many times we've walked into a home where the trim was painted pure white, the kind of white where they didn't even bother adding colour to the can. I cringe just thinking about it. Although many may think that white is white, choosing the perfect hue of white is difficult since each shade has a subtle undertone to it, making it harder to see with the naked eye. However, once compared amongst each other, the evident undertones appear and the decision making comes to play. 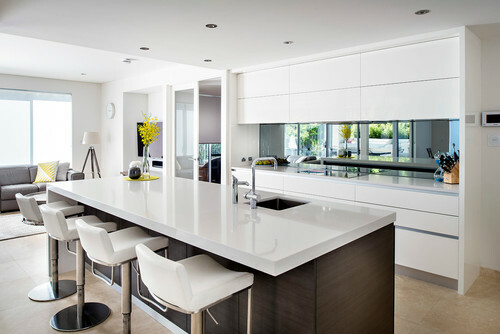 White should be chosen with caution, taking into consideration all of the other fixed finishes in the home, however here are a few of our go-to whites to help narrow down your process. Simply White was Benjamin’s Moore color of the year in 2016 and we understand why. It is one of our favorites because it is fresh and bright. It’s subtle warm yellow undertone, makes it a warmer, more appealing white. 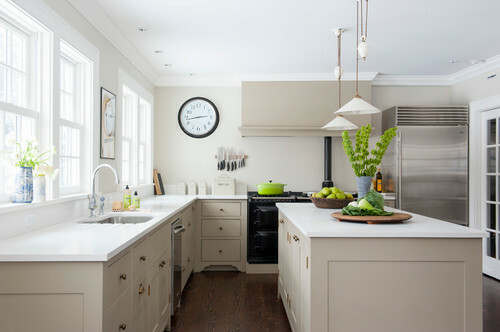 We typically use this color for our kitchen cabinetry and walls. 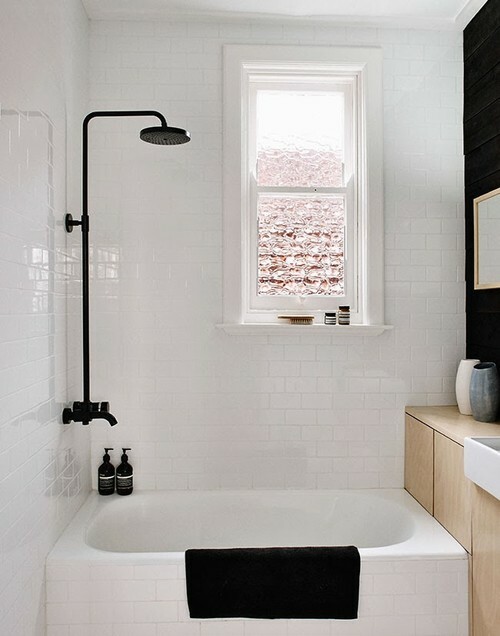 This would probably be the whitest white that we would put on walls before the walls start to look too stark or sterile. If you’re looking for a pure, bright white, Chantilly Lace is the one for you! It is best used for trim, frames, doors, mouldings and also kitchen cabinetry. Considering this color is the closest to a stark white, it will never look unclean in comparison to other whites. Chantilly Lace falls under the category of cool whites, due to its slightest blue undertone. Cloud white is loved by many designers because of its warm undertone that makes it a creamy white. However, if placed in the room as being the only white, it looks like a pure white. Cloud white needs to be used with caution when paired with crisper whites. It can very easily look too creamy. This is a great white when paired with more muted colours or neutrals with warmer tones. Intense white appears slightly grey. It’s green undertone balances the warmth making it a great choice to use throughout an entire space. It gives off the perfect contrast paired with Simply White or Chantilly Lace trim. This is not however a colour we would use on trim. Albeit the name suggests it is a white, we would probably categorize Intense White as a very light grey. This feature wall is a combination of Intense White & Simply White, which really shows you how greay it is. 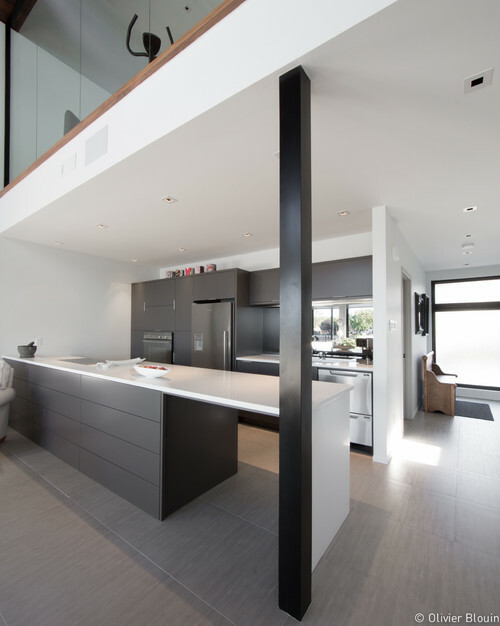 In this example, the Intense White walls actually look white next to the concrete grey ceiling and lack of white trim. If you spot the baseboards, that's where you can see that the walls are in fact light grey. Sample Viewing - Get a larger sample of your colour swatch! It is very important to see a larger scale of your color to help understand their undertones. We use 11" x 14" large painted colour samples that make identifying undertones simple and almost obvious - even to our clients who have no experience with colour. 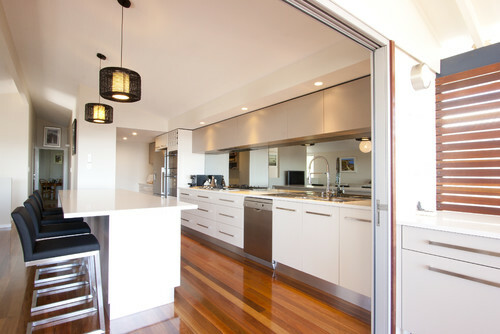 Natural Light - Colours can vary immensely from room to room. Therefore, knowing which direction your room is facing can either pull out a warmer (south side) or cooler light (north side). This can play on how evident the undertone will be once painted. Finishes - Make sure you pick the proper finish for your paint colors. Eggshell walls for a matt look, but somewhat washable. Doors, frames, and mouldings should be painted semi-gloss for dirability and washability. Finally, ceiling should be painted matte since matte hides most imperfections and will give you a seamless surface. All white everything - If your walls and trim are white, the idea is either to go one shade brighter on the trim to create some contrast or to keep the same colour throughout, however still in different finishes. Understanding and identifying undertones is important to create a clear flow within your home. Choosing colour can be extremely stressful - I get it - which is why hiring a True Colour Expert will give you the confidence you need when picking out the right colors for any space. If you are lacking confidence, we highly suggest to consult our website's colour page and ask for our expertise to guide you every step of the way ! We missed the boat this year on our blog featuring 2017's trend prediction, but there's one that we're really starting to see in kitchens that is totally blog worthy. I'm not sure if this is really a trend - more a category of trends that all achieve the same goal. Given the rise in popularity of open concept kitchens, great rooms and small open concept condos, we're seeing more and more kitchens that blend into the rest of the living space. We've already seen it with flooring choices. When open concept kitchens first started becoming big, we were still installing tile on the floor, and keeping the visual room division since the tile would define the kitchen area. Now, I think we're installing wood flooring in 100% of our open concept kitchens. 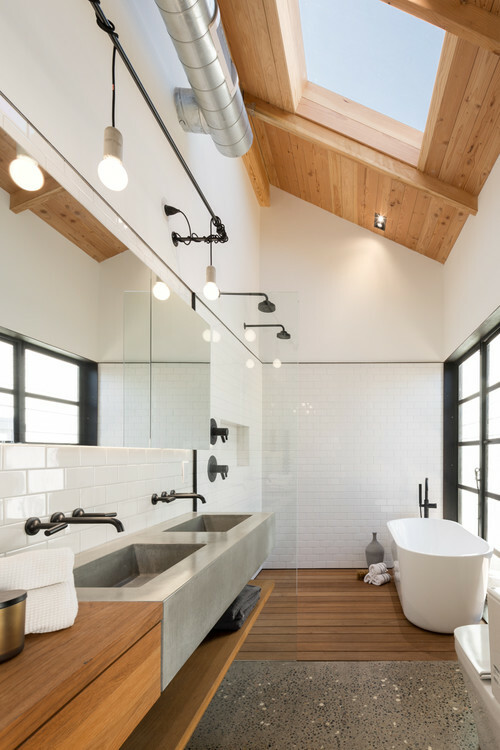 The wood trend is so big that its practicality is no longer a concern for homeowners and we believe that we're going to keep heading in that direction. 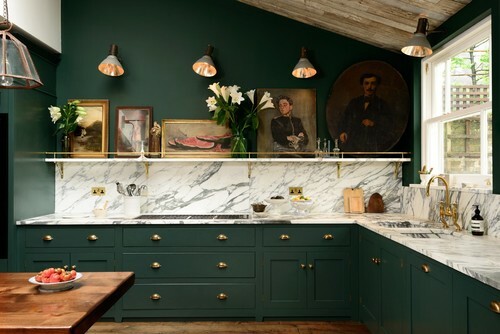 Homeowners are starting to be more willing to sacrifice some practical elements of their kitchens for aesthetics since the kitchen is open to the rest of their living space and will therefore have a greater impact on the overall feel of their home. Here are the top kitchen trends that lead us to believe that we want our kitchens to blend in with the rest of our furniture. 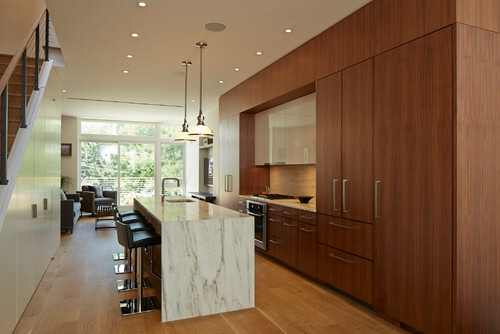 We've seen it first hand with our clients that designing a kitchen with no uppers used to be unheard of. 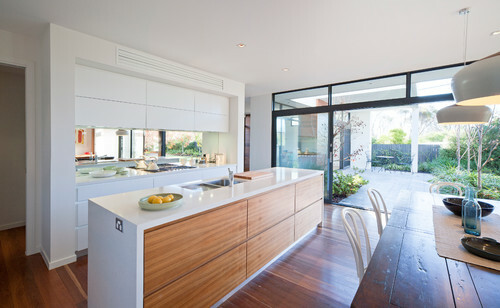 No one would even consider it since the main focus in kitchen design used to be maximizing storage. Well, in 2016-2017, we've designed several kitchens with either no uppers or very few uppers and we didn't have to twist anyone's arm either! 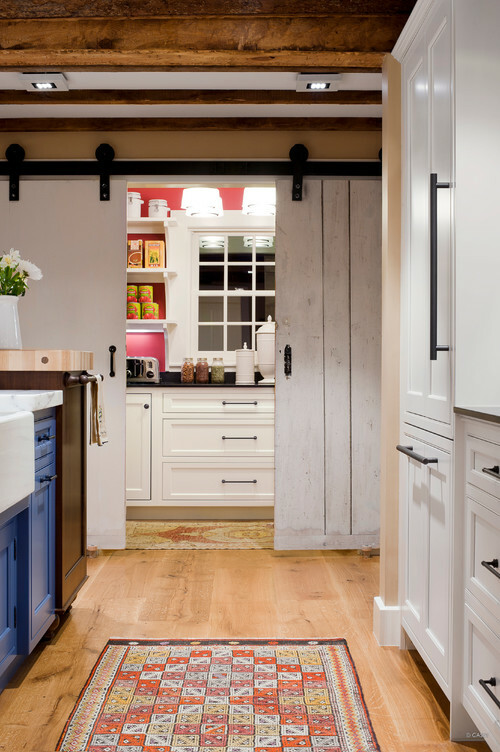 Homeowners are willing to sacrifice a little storage to create a kitchen that feels more open, lighter and fresh. 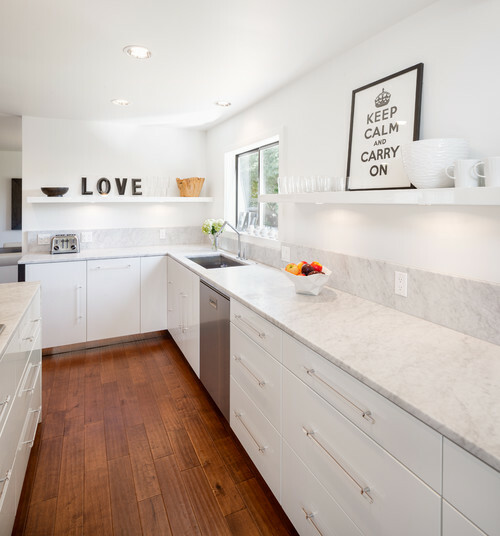 Having no upper cabinets allows for the use of a fun backsplash, a larger window or even a blank surface that can be decorated with art or floating shelves. Although this can be quite the splurge both in cabinetry and in the actual appliance, we're seeing a rising trend for panelled appliances. The brass trend may be influencing it since some people don't like the look of mixed metals which happens when you pair brass hardware with stainless appliances, but I'd like to think that it's because we want our kitchen tools to say hidden. By panelling the fridge, dishwasher and hood vent they just become another piece of furniture. So much so, that I wouldn't be surprised if panelled ovens will soon be available. Open shelving has been around in kitchens forever, but these days, we're not using the shelves for dishes. We're displaying art, books, accessories, anything unconventional that would steer your mind away from being in a kitchen. This one is definitely not for the master chef, but very practical for the entertainer or pro takeout orderer (I fall into this last category!). 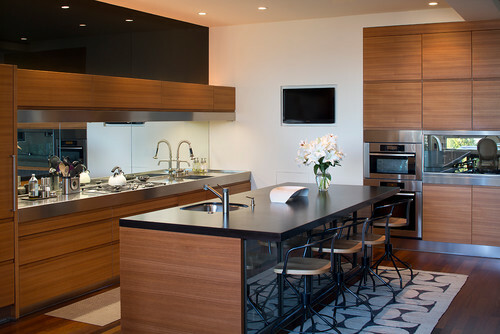 With open concepts, kitchens have become THE gathering point for dinner parties and cocktails. Everyone huddles around the island with a glass of wine and its even sometimes difficult to get guests to take a seat. As a host, the challenge is to keep our workspace clean and presentable since its visible to all. So much so, that some have built separate rooms, off the main kitchen that can be used as a secondary kitchen fully stocked with a sink, dishwasher and even an oven. Yes, you read right, they've built a "show kitchen" that is kept clean and clutter-free while the mess is being made in a separate room. 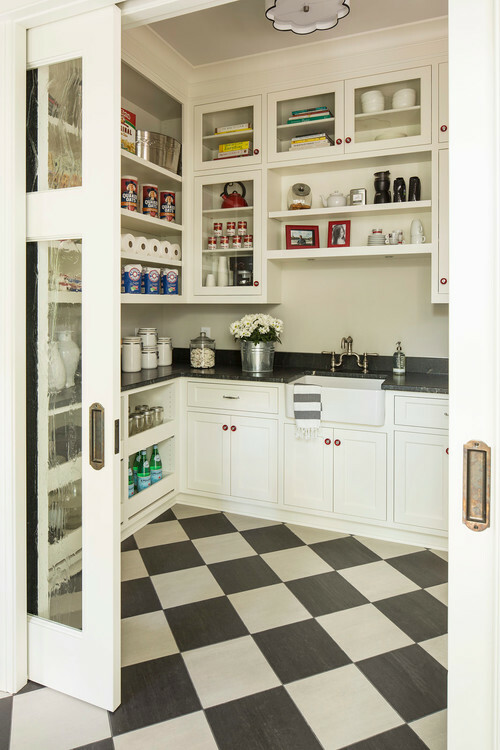 Butler pantries are historically a room joining the kitchen and the dining room that serve as a prep space for the meals, beverages and dinnerware. Since most of us no longer have butlers, this room can be repurposed and used for a little more than setting plates and serving drinks. It also allows for more creativity with the design since it's a closed space. Whether you're looking for something totally unconventional or a traditional kitchen that will be a timeless addition to your home, we can help you with the entire process! Contact us today to schedule a consultation. What's the deal with white window frames? I'm not talking about trim (this time), I'm talking about the actual frame. The one that gets installed with your actual window. For years the standard has been white on both the inside and out. Now people are following trends and deciding to go with black on the outside but they still insist on keeping the inside white. In fact, some people are actually paying more to have both colours; black on the outside and white on the inside. Let me tell you what my problem is with white frames. First, and foremost, it's totally the wrong white. All of the standard white aluminum windows and doors are this horrible, super stark white with a tint of blue. I say tint, but really, I mean that they are blue-white. As soon as the trim is painted a decent white; Cloud White, Chantilly Lace, or even (my favourite) Simply White, you will see that most window frames are really a very light shade of blue. It's terrible. If this isn't a reason enough, did you know that black frames actually give you a better view? That's right folks, blacks frames are less distracting, therefore they take away less from your incredible, lush, green view. Where as white demands all of your attention, which completely cuts your beautiful view. What colour will I paint my trim? Easy! Either something to blend in with the black frame or something to blend in with your wall. Black frames with black or dark trim looks great. Black frames with off white trim and an off white wall also looks great. Black frames with white trim and dark wall doesn't look so great. The idea here is not to have too many contrasting colours next to each other. Can't decide? Skip the trim all together. 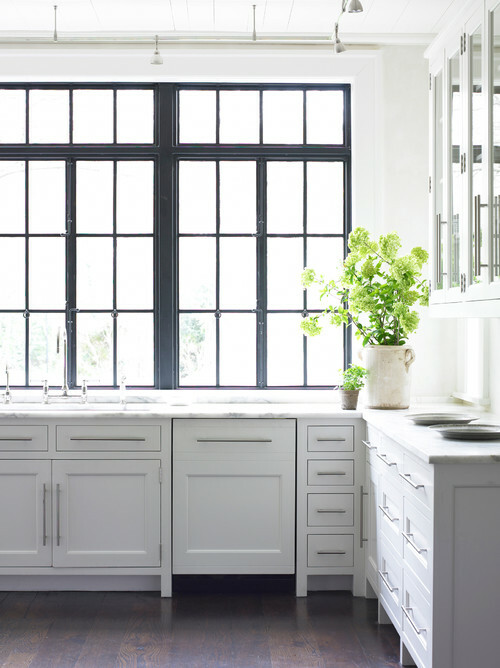 Black window frames look best without trim. Whether your space is ultra modern or traditional, this is truly the best option! If you're still indecisive or if I've confused you any more, give me a call to schedule a colour consultation. I'll be happy to not only help you choose the right colours for your home, but to explain why they're the best choices too! I'm sure a trend that all of you have noticed pop up in hardware and plumbing fixtures is gold and brass. Would you believe me if I told you that black is already creeping up on gold for the number one spot on the hottest trend list? Mat black to be precise. We're seeing it everywhere; in decor details, on furniture, in the way we frame art and accessories. A room is never complete without at least a little of the darkest on the colour scale. I have to say I'm quite excited about this and I'm all for putting the sensible me aside and jumping all over this trend! First of all, let me make myself clear (if you haven't caught on already), this IS a trend and with all trends, this WILL eventually fade. However, that does not mean that we can't have a little fun with this one. 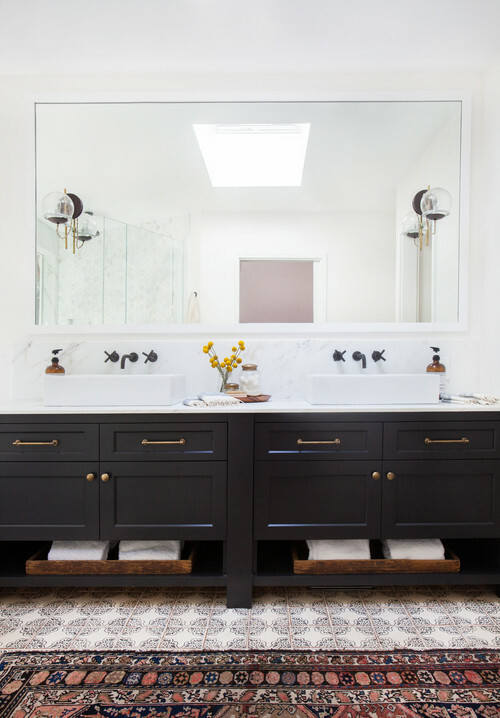 Hardware is tricky because you would usually find similar coloured hardware throughout your entire home; your door knobs, cabinet pulls, plumbing fixtures, light fixtures. They probably all match. Which means that when they go out of style, they ALL go out of style together which can be quite costly to change. Costly but not difficult. Which is why we can totally still have fun with this one! These aren't quite black but pretty beautiful if you ask me! On a side note, I don't believe that your hardware all does have to be identical. I have no problem mixing black knobs with brushed nickel light fixtures. Or mat black and brass! Really? Who has a problem with that?? I'm going to give you a little tip: this trend looks absolutely fabulous with white and lots of it. As you can imagine, having too much black in a space can get dark really fast which is why it should really only be used as an accent and in moderation. Unless you're designing something like a night club, or a bar, or a vampire's room. Whatever floats your boat. Are you with me on this one? Are you loving this trend or not so much? Leave us your feedback, we'd love to know what you think! 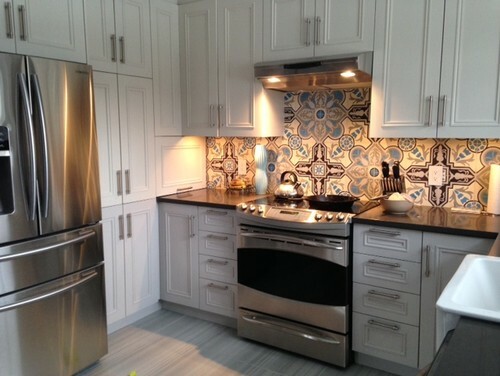 When it comes to backsplashes, I'm a strong believer that less is indeed more. As you can read in this older post; How To Backsplash, a trendy backsplash is truly a recipe for disaster. 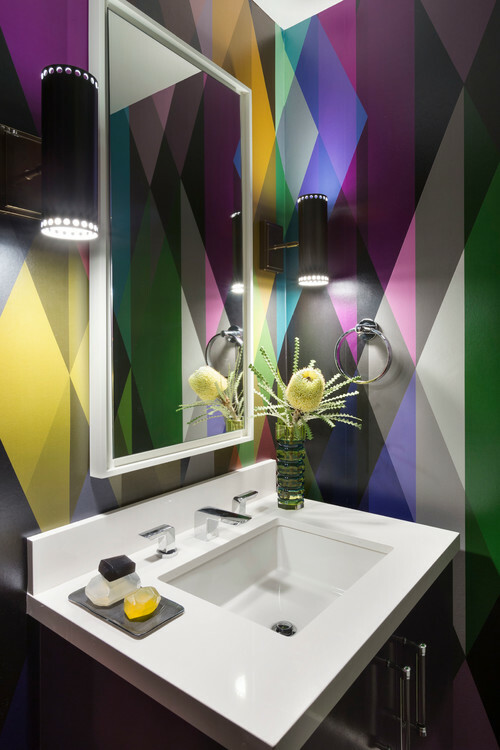 Finding that perfect last piece to complete your design can be as simple as mirror. Perhaps an older concept that has seen its day, like a lot of older options (ie; the subway tile), a mirrored backsplash can be the perfect timeless detail to complete a contemporary kitchen. 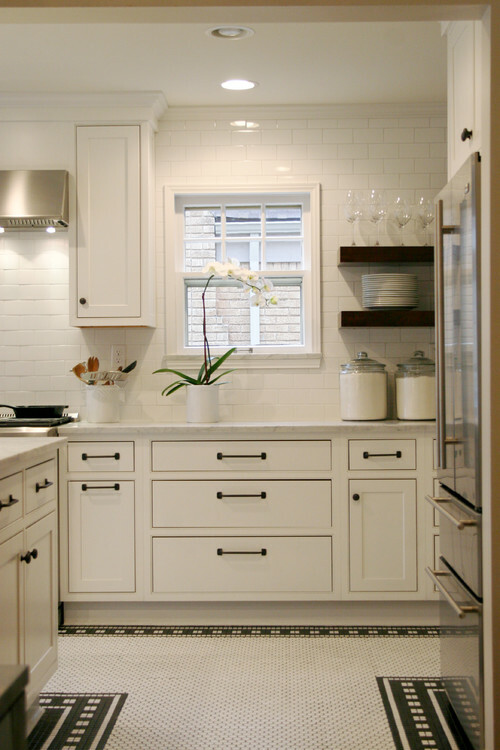 I love this look when there isn't much backsplash to cover which is often the case with open galley kitchens. When you have a small surface, adding another element to a kitchen can look out of place or too busy. 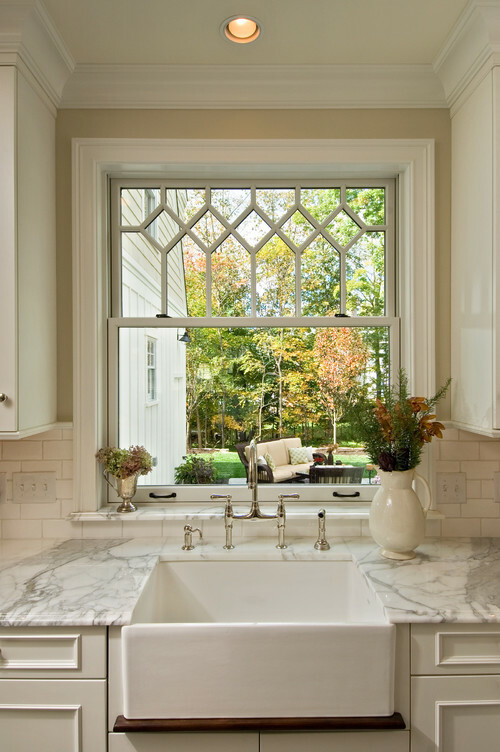 Also a great solution to bring in more light, create depth or extend a beautiful view. As always with the start of a new year, it seems like everyone has something to say about the year's upcoming trends. With colour being such a huge factor that plays into everything design related, we all want to know what direction it'll be heading. After Pantone released their 2015 colour of the year, I was a little surprised by the choice but not shocked that we are moving towards warmer tones. I find Montreal to be a very avant-garde city where we adapt very easily to change and we embrace it with open arms, no matter how drastic. We quickly turned the page on yellow-beiges and browns over ten years ago while some cities in the States are still in the process of making the transition to the cooler grays. Unlike our neighbours in Toronto who tend to keep it classic, we're open to bold pops of colour, crazy patterns and everything trendy. This wallpaper will be rarely seen in an upscale home in Toronto, yet it's probably a great seller here in Montreal. With our modern lofts popping up all over downtown and its vicinity, it's not unusual to see bold pops of colour in their lobbies and common spaces. This shows that we are among the first to embrace a new trend and also the first to get sick of an old one. Looking ahead, colour forecasters are saying that we are moving towards the warmer tones inspired by nature and I'm truly not surprised. In this city, we jumped from the beiges to the cool grays so fast that now everyone is finding gray too cold, too industrial so we're already leaning more towards "greige", taupes and warmers grays. I don't at all think that we will be bringing back the beiges and browns of the 90s but we're definitely going to be seeing our current favorite neutral evolving soon. In a world where being green is so important and everything organic and natural is spreading like wildfire, who has room for industrial grays? It just doesn't seem to match. When aviation was in its prime, it inspired the streamline Art Deco design style of the 1920s, 30s and 40s and that's what's going to happen again. Trends are dictated by what's happening in our communities, and what's making headlines globally. Right now we are going back to basics, we are more interested in the old than the new. Eclecticism is trending where we recycle, reuse and mix and match with little rules. Check out my blog on Wabi Sabi which is a Japanese philosophy that's looking very trendy these days. Projects and movements making a small environmental impact and a big statement are huge trend influencers. Eco friendly travel, including developments like the Mashpi Project, are proof that the need to connect to nature is there and probably stronger than ever. This need was born from the advancements of our society, technology, industrialism and the lack of nature in our surroundings. Let's bring nature back! We will soon see the return of florals, and although some people may think that this would be going back in time, it's not quite done in the same way as what we saw in 80s. Natural finishes and raw material are here to stay (for a while I guess). Seeing the grain in wood, lightly stained pieces and simple scandinavian design are all big in 2015. Layering different textures and materials and mixing bold colours and patterns are also among styles that I look forward to seeing. Like what you're reading? SUBSCRIBE to our monthly newsletter for blog posts and design tips. I wasn't able to make it over to Toronto this year for IDS, which is their version of SIDIM, but all I've been seeing from the designers I know in Toronto is about the IKEA kitchen booth. It seems to have impressed quite a few big shot designers and its left me very curious. From what I gather, they are launching a new kitchen program on February 2nd, 2015 that will bring a solution to a lot of the problems that most of us have with IKEA kitchens. 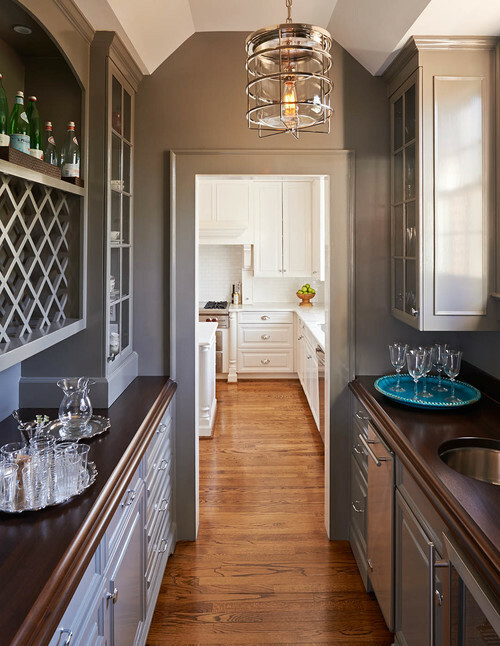 They are promoting more options for cabinetry sizes, which means that you can achieve a custom look in a space that would normally not fit their standard sizes. They are also stating that we will have the option to have drawers within doors, which is very practical for a modern look where you'd like the drawers to be hidden within your cabinet doors. It looks like they will be launching some new finishes as well, including a true black instead of their standard brown black that screams IKEA. All of this along with BLUM soft closing doors and drawers leaves me with an open mind about IKEA for future projects on a budget. Of course, it would have to be professionally installed - I've seen one too many IKEA kitchens that are badly installed where the kitchen ends up completed crooked and looks like it's falling apart. The only real way to make an IKEA kitchen work is to pair it with a fabulous finishes; a beautiful tile, upgraded stone counter and/or an eye catching backsplash. It looks like it would also be a great solution for a custom bar or bathroom vanity, rather than a full kitchen. Check out what IKEA has to say about their new line SEKTION. I mean, does this look like IKEA to you? I just love the drawers on this piece and even the hardware is beautiful. Picture taken by Toronto interior designer, Caroline McKay. This is a big trend that I admit to completely falling for. 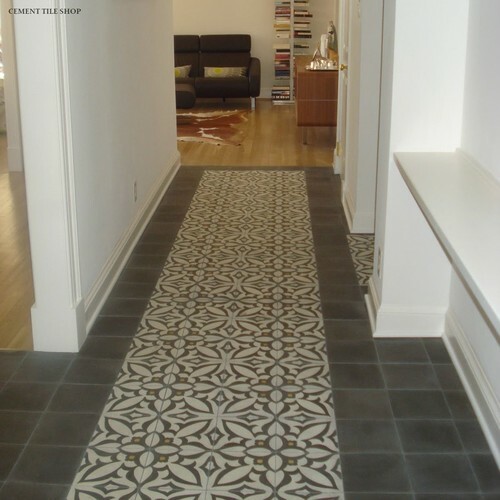 These beautiful graphic cement tiles bring in character and old school charm, yet they are very trendy and in these days. You can mix them with simple, neutral finishes and, if used correctly, can give you a beautiful timeless design. 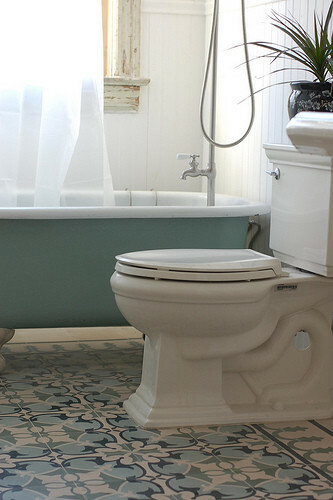 I've used these types of tiles for several projects and they've always made the space. They are a little more difficult to work with because they need to be sealed and given their weight, shipping costs can get a little crazy, but ultimately worth the extra effort and cost. My practical side needs to give you a few words of caution: Only use something like these in your space if you absolutely love them and feel that you will always love them. Because like any big trend, these will age your space in a few years when you can no longer find them in a single store. That being said, this is my personal style, so I would happily put them in my space even if I'm the only one with this look in ten years. 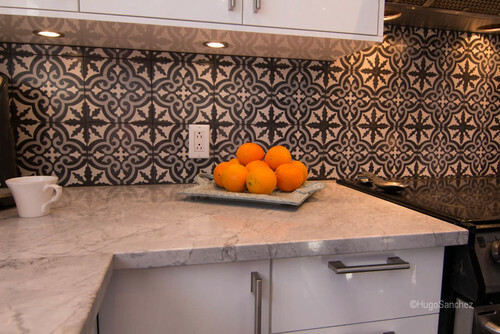 Would I suggest that you put this tile in an investment property, or a flip? Definitely not! An accent this strong needs to be installed in a space built for you, taking into consideration that there's a big chance that the next owner will rip it out. Don't be discouraged! There's a way to work with this stunning tile to make it work forever. If you'd like to see this kind of accent in your space but you're not sure how to pull it off, contact us to schedule a consultation. Love this look, but need help putting it together? Contact me to book a consultation! SIDIM HIGHLIGHT: DID YOU KNOW THAT LG MADE QUARTZ? The product line is called Viatera and what really caught my eye was that some of their samples looked so similar to marble. Quartz is so popular these days, that there's quite a bit of competition among the different manufacterers. From Ceasarstone, to Silestone, to Hanstone to Korean replicas, you can now find this factory made product in so many different colours and patterns. None the less, when I saw these unique slabs from a distance, I knew I had to take a closer look. I have so many clients who love the look of marble but don't love the maintenance involved, which makes these the perfect solution. Can't wait to get my samples and put them to use! I completely fell in love with these tiles from Ceracolor the other day. They are textured ceramic tiles in fun patterns. Individual tiles, but sold in sets of nine so you would get this full pattern which can create a really fun eclectic look. I don't know where, but I'm on a mission to use these somewhere! MARBLE, GRANITE, QUARTZ OH MY! WHAT'S THE DIFFERENCE BETWEEN MARBLE, GRANITE AND QUARTZ?? I thought I would address this on my blog so that I can have something to send to my clients since this is a question that comes up so often when deciding on a countertop stone. 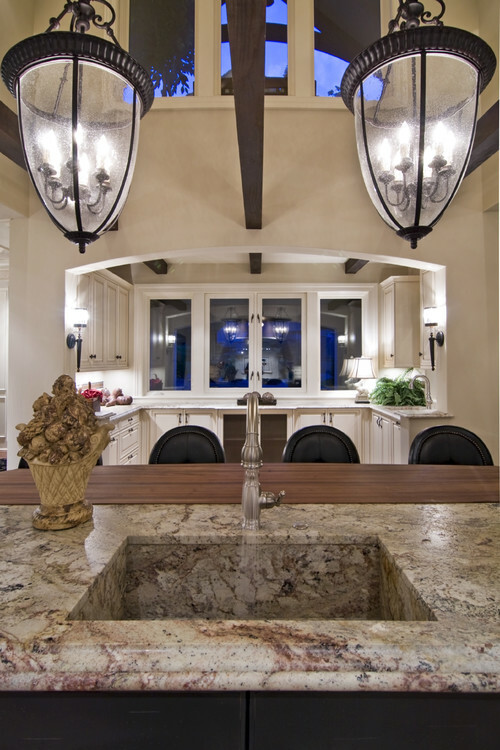 There are several options for stone counters; marble, limstone, granite, quartz, quartzite. They all have their own qualities and unique pros and cons. Here's a useful breakdown of each material so that you know what you're getting yourself into before your countertop is installed. I tend to put MARBLES and LIMESTONES in the same category since they have very similar qualities. They are probably the most beautiful stones on the market, they are both natural and they are also both very porous. Natural stones are those that have not been modified by man. They are dug out from specific quarries and other than being cut and polished, they are left in their natural compositions. Marbles and limestones, by nature, are more porous, which basically translates to: they stain. No matter how well the stone is sealed, if you leave a wine spill, or anything acidic on it for just a couple of hours, you will be left with a permanent stain. This is why I have a very hard time specifying this stone for kitchens. People still often use it in kitchens, but they have to be very careful; they have to seal it regularly and still be okay with stains appearing over the years. That being said, there are certain marbles and limestones that are simply irreplicable aesthetically. For that reason, to some, they are simply worth the sacrifice. 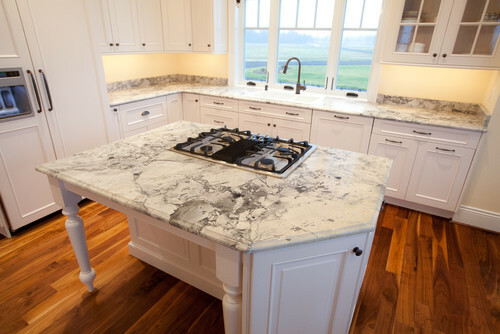 GRANITE is also a natural stone, and a more popular choice for kitchens because it's not porous. This is the best option for durability and low maintenance when you are considering a natural stone. The only problem that I have with granite is that it's difficult to find slabs that I like. They tend to have more specs and patches than marbles which are more linear and veiny. The colours can also be difficult to work with because one granite can have 3 different undertones. It comes down to finding the right slab to fit your vision. Sometimes you get lucky, other times it's close to impossible. The worst part is that you can fall in love with a specific granite, and once the quarry has run dry, you won't see it ever again. This is also what makes the price of natural stones fluctuate so much; its availability. 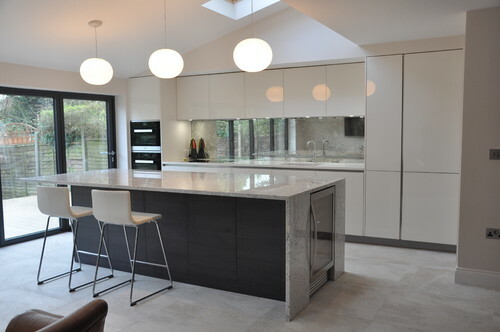 QUARTZ is another really popular choice these days. Partially because of it's strong durability and stain resistance and partially because it suits today's modern, clean trend. This factory made product is composed of one of the hardest minerals on earth and is, like granite, not porous. It comes in a variety of colours ranging from solids to patterns that resemble a more uniform granite. 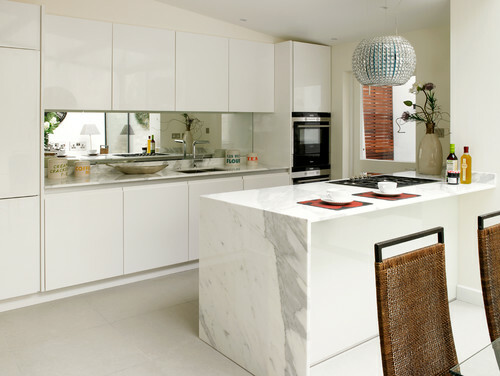 The great thing about quartz is that you don't have to choose your slab. Since it's man made, you know exactly what you'll get, even from the smallest sample. One difference to consider between granite and quartz is that you can place a hot pot directly on a granite counter without leaving a stain. It's not the same for quartz; because of its high resin content, a hot pot will leave a melted yellow ring on your beautiful seamless counter. Quartzite is a cross between marble and granite. The beauty of quartzite is that it can sometimes resemble marble but carries the properties of granite. This is a great example below. Super White Quartzite has a lot less going on than your traditional granite, it actually looks very close to a white marble (but with more grey), yet it is not as porous as marble. It becomes the perfect option for someone who wants a look closer to marble but without all of the maintenance. The thing to consider about quartzite is that since it's a mix, certain parts of your stone can be more porous than others. This means it's very important that it's well sealed at all times. It's easy to tell whether your counter needs to be sealed or not. All you need to do is let a drop of water sit on it, if it bubbles up at the top, it's good, and if it gets absorbed, it's time to re seal your countertop. This applies to all natural stones. I still would not risk a wine spill to sit on the counter for more than a few of hours. If you are in the Montreal are looking for a fantastic Stone supplier, check out Stone Co Inc, at 6400 Trans Canada Hwy. They have the best prices and they are the only supplier I've found in Montreal that is able to deliver and install within a week! Although they can be sometimes overlooked, a set of beautiful knobs can really make a piece. Whether you're building a custom piece from scratch or just changing knobs on an existing piece to update the look, this is where you can make a big impact for a small cost. I like to get creative with my hardware whether it's on furniture, kitchen cabinetry, vanities or doors. Here are some beautiful inspirations and fantastic sites to start shopping. Zara Home has a great selection of knobs, handles, pulls, hooks. They also recently opened a store in Carrefour Laval. When they launched their website, I was hooked, up all night mentally documenting everything they have. Beautiful! Anthropologie is an oldtime favourite of mine. This store is really great for all kinds of stuff but it's really my go-to store for hardware. They also recently opened a store in downtown Montreal but their selection for home is not huge in store. Your best bet is to shop online. We purchased these knobs from Anthropologie for a clients to tie in her nursery colour and give this old piece a new look. And as much as I looooove their door hardware - as I am sure you will agree once you see this image below - unfortunately, they are close to impossible to install. I've ordered them before and they are not made for North American doors. My dad (who is a very handy guy) struggled with it for over an hour and once it was installed, it still wasn't perfectly functional. For more classic, but still original options, check out Restoration Hardware.